You are here:Home » Suits » "The Cut of the Suit." 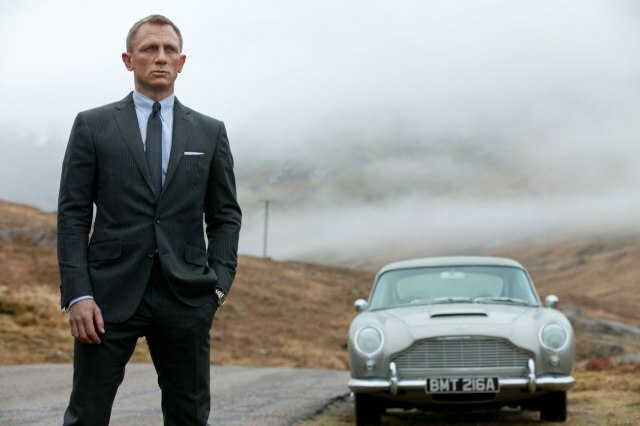 A review of the Bond suit. "The Cut of the Suit." A review of the Bond suit. Skyfall has landed and while some critics are claiming best Bond ever, the standout element was Daniel Craig and the cut of the suit. Through many action scenes that saw Bond fighting, running, kicking, riding and jumping, the suit stayed true, always holding form as the hero’s suit of armour. London’s Daily Mail reported that sales of suits increased by 68% in the weeks following the launch of Skyfall with the slim fit grey suit running out at record rates. Tailor and Bond fan Peter Frew of ArchangeloSartorial, says that the key to Craig’s suits holding form throughout is a higher set for the arm holes and the back of the jacket, allowing greater freedom of movement in a tightly fitted piece. Similarly, for skinny, slim fitting trousers, a higher crotch is the key for more aggressive movement. While Tom Ford has taken the Bond suit to a new level of suave, were the tailors of earlier Bonds - Cavali, Brioni or Versace – the ultimate designers of a hero with sophistication? Sean Connery in tweed and the original classic tux. Did Roger Moore own something special with the white jacket tux? And Pierce Brosnan is often overlooked as a worthy Bond but he gets the nod from many women as the most savoir-faire. If $4000 for a tailored suit is out of your reach, then get yourself a tailored look with a shirt, jacket and suit with a cut that was meant for you. At Sizemikk, you can create a profile with your own size, shape and style, then shop the stuff that fits like it was made to measure. Sizemikk – get the tailored look.